How Do Handwritten Letters Grow Pipeline? Handwritten letters delight customers. And delighted customers retain 4-5x longer, spend 18% more and refer an average of 9 new customers. Are your customers worth more than $100? 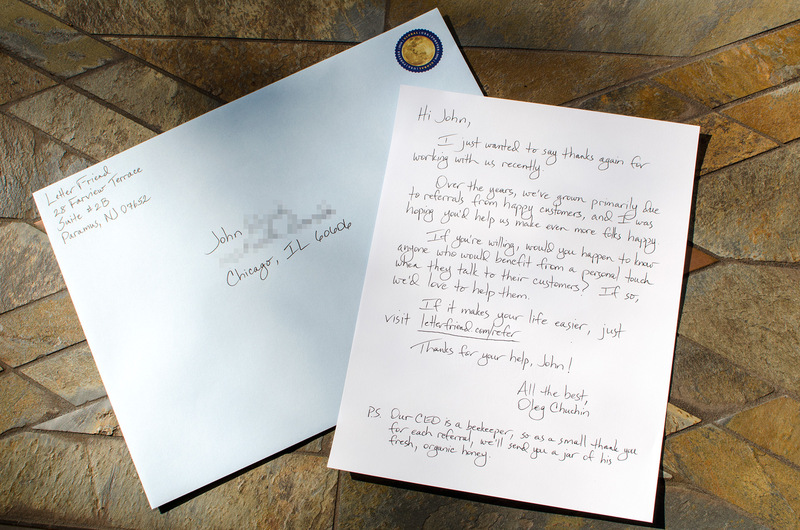 Then handwritten letters are a great way to create the type of wow experience that leads to loyalty and increased revenue. 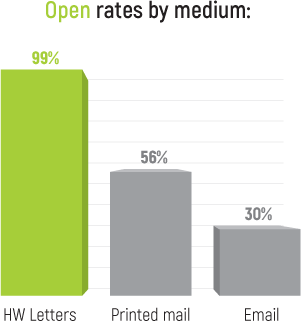 Our customers regularly get 3-6x higher response rates than with printed mail. Handwritten letters almost always get opened and read. Customers can see and feel that you’ve put in the time and effort to delight them with a personal touch. 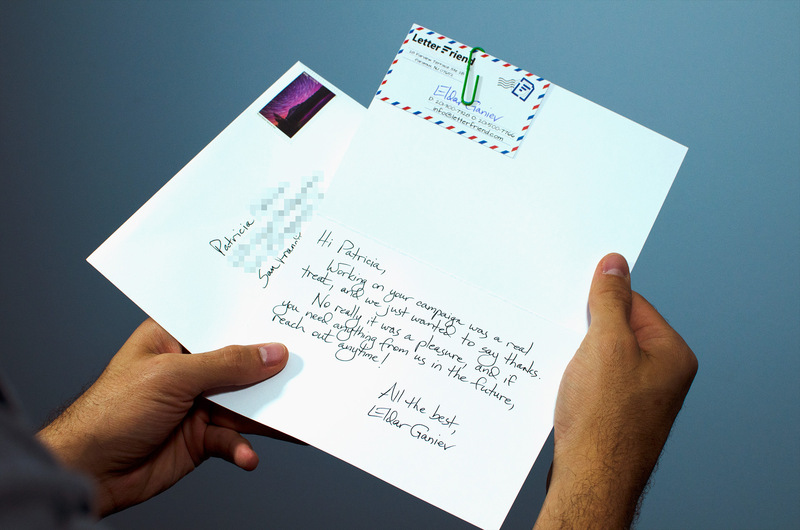 Sending handwritten letters will quickly set you apart from your competitors who only send printed mail or email. Take a look on social media to see how some of the world’s most customer-centric companies are growing with handwritten letters. Handwritten letters give your customers a reason to talk about you online and with colleagues, friends, family and their wider network. Many people have said that they went with us because of the thank you cards. 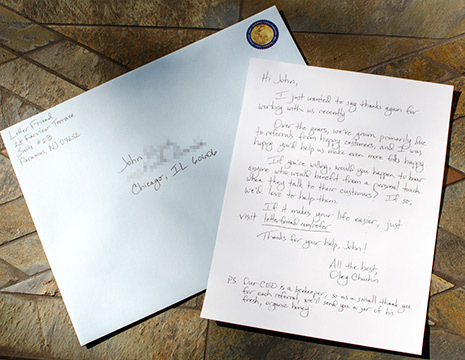 The feeling customers get when they receive a handwritten card instead of a printed one – it makes a big difference. Many people have specifically said they went with us because of the thank you cards, because we have that personal touch that nobody else does. A personal follow up thank you after a meeting, a purchase or an event will make you unforgettable. 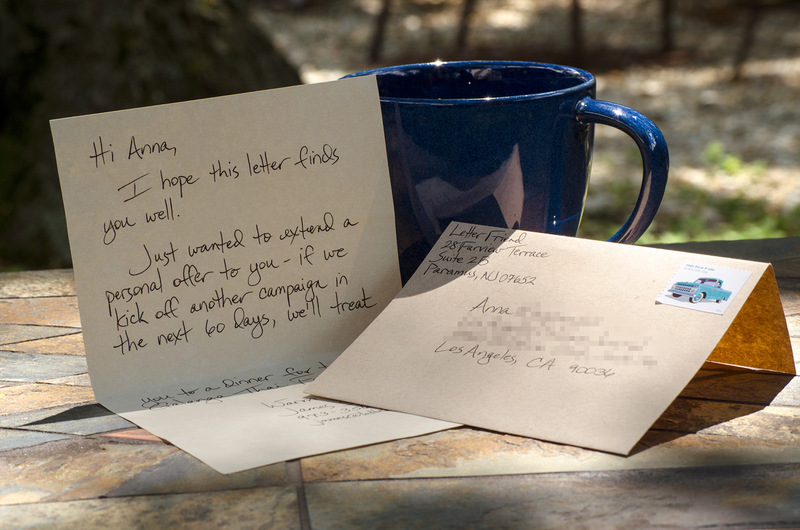 If you’ve never sent handwritten letters before, this is a great way to start. This study found that donors thanked with a handwritten note were 38% more likely to donate again. And, don’t be surprised if customers rave about you on social media! Referrals are very valuable. Referred leads are 4-6x more likely to close than an unqualified lead — and they have higher lifetime values. 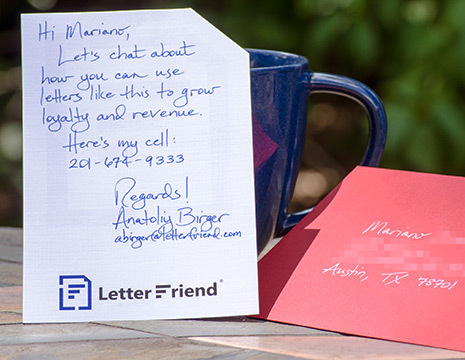 A handwritten letter is a personable way to ask for something inherently personal like a referral. 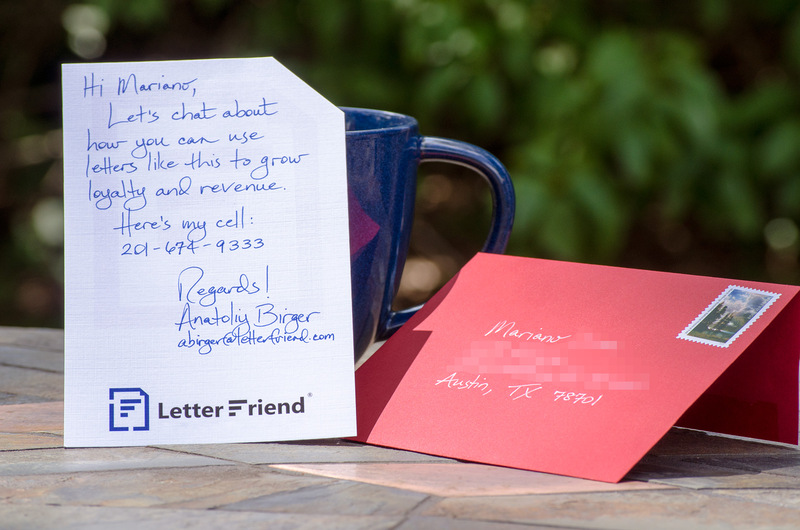 Because handwritten letters are acted upon much more than email or printed mail, they are a great way to optimize your referral rate. This sample letter is more expensive because it has a lot of handwritten words! If your customers are worth more than $100 to your business, handwritten letters can be an excellent choice for prospecting. 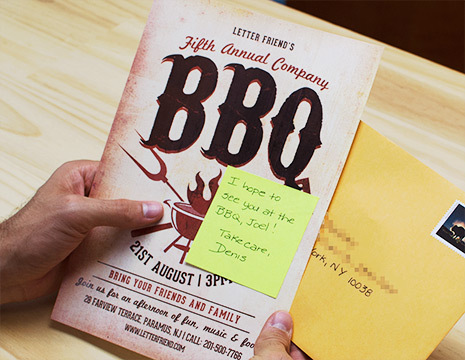 Handwritten letters have a 3-6x response rate when compared to printed letters. Some companies with very high-value customers will send handwritten letters along with chocolates or flowers — to prime the pump for their sales team. 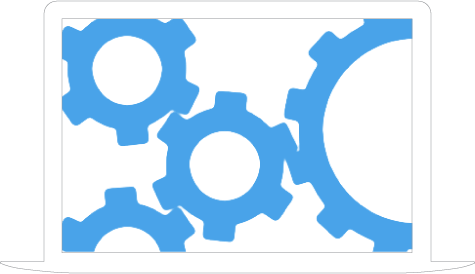 Can’t seem to get through to inactive customers or leads? Even a busy person reads a handwritten letter. For best results, you may want to offer an incentive — we can help you create one that fits your business. To increase customer retention rates by only 5% will increase profits by 25% to 95%. 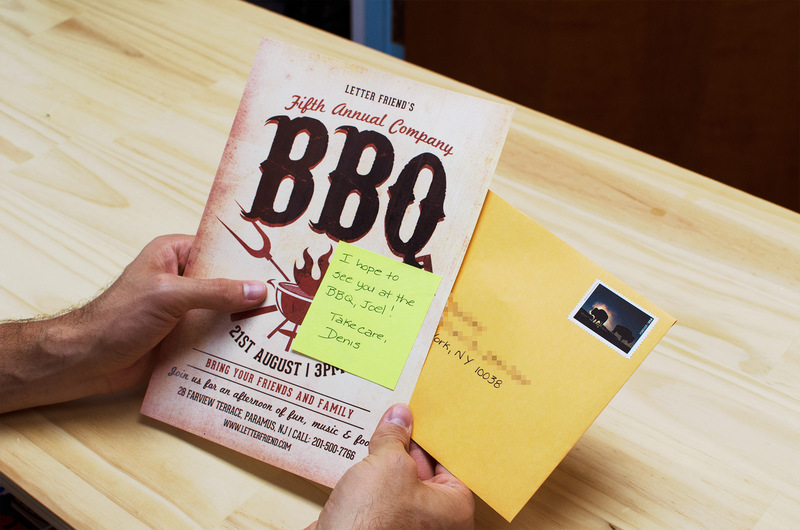 Keeping your customers in the loop with handwritten letters will help you stay top of mind, and will increase retention and customer lifetime value. Price includes the printed flyer. This option is less expensive because there is less handwriting. Send additional items Business cards, gift cards, t-shirts, coupons and chocolate… oh my! Only envelopes or letters? Yes! We’ll do only envelopes or only letters and mail them back to you! Printing done for you Send us your stationery or have us print your logos or design on ours! The customer service has been fantastic and the price was better than anyone else. 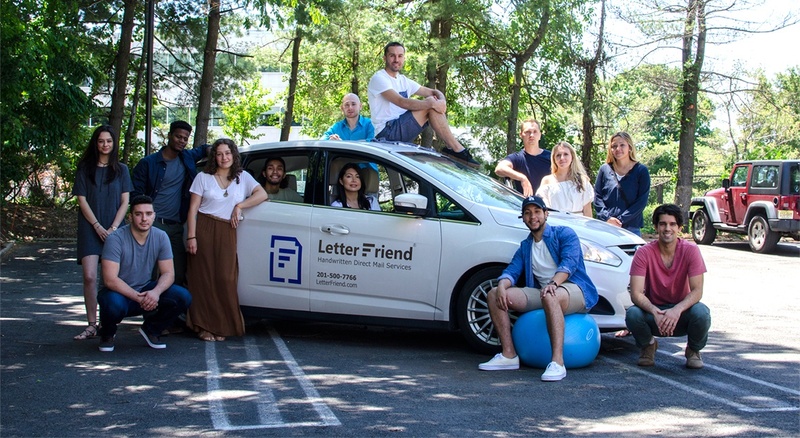 We’ve had a great experience with Letter Friend. The customer service has been fantastic and the price was better than anyone else we spoke with. We’d definitely recommend them. If your team has been writing handwritten letters themselves, you’ll know how effective they are. You’ll also know how much writing them in-house can steal your time and focus. 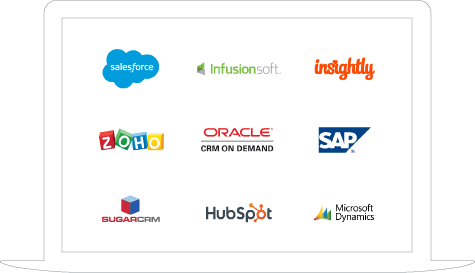 Grow relationships and reclaim your team’s focus with our CRM integrations. 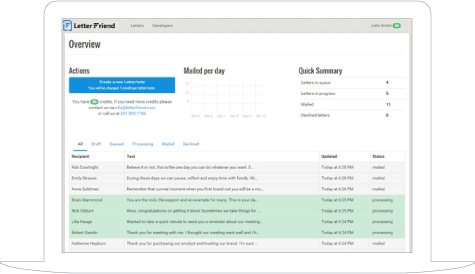 Send letters in bulk or one at a time with our web interface. Use one of our templates or save your own so you don’t have to spend extra time writing or tracking down old copy! Most companies start with option 1 or 2. But rest assured: if you need complete control, our API is always there. Your team’s work was above and beyond extraordinary. The team and I wanted to reach out to you and say thank you for your excellent and expedient service for our mail campaign. Your team’s work was above and beyond extraordinary. You paid attention to every detail – and there were alot! 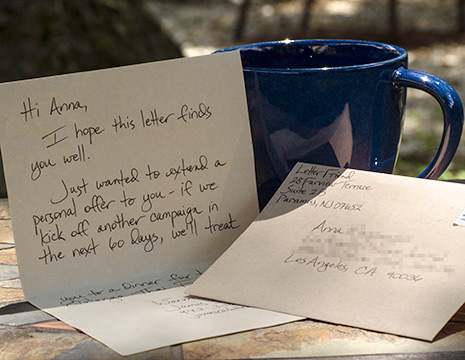 – and we expect great response from the handwritten, personalized notecard campaign. Thank you for being a vendor we value and trust. We’re a company that deeply believes in the power of the human touch. Our first letter was a heartfelt one sent to a friend halfway across the globe. Now we’re fortunate to send 10s of millions of words a year, and to do what we can to make the world a better place — both inside and outside the company. We are committed not only to excellence in service and customer care, but also to compassion. Everyone at Letter Friend can feel it. We hope you’ll feel it, too.